Bug / Feedback Reporting - AppAssist tool provides an option to point out where the bug is from the app itself. Users can send their feedback and point out the mistakes in app directly from the mobile device. Screen Image Capturing - AppAssist gives an option to capture the screen of app and with easy editing tool you can annotate and submit to the developer. Additionally you can describe the screen captured with an audio recording feature. Screen Video Capturing - To avoid chances of miscommunication and misinterpretation and to help reproducing bug in development environment, AppAssist also provides an option to record screen and submit video feedback along with audio. Bug Tracking - AppAssist's webpanel allows you to track the bugs reported for any build. Bug report contains all the necessary information developer should know about bug and / or crash. You can filter the bug reports and at the same time you can assign it to respective developer. Additionally, you can forward your app's bug reports to 3rd party service hooks like bugzilla. Crash Reporting - AppAssist helps improve your App's health by submitting crashes happened during the app testing. A crash log will contain all the information developer needed to resolve it. For iOS, AppAssist automatically symbolicate the crash log information and avail it in interpretable format which makes developer job easy. 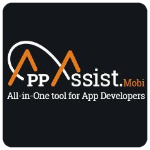 App Distributions - AppAssist helps distribute the app with your team members so developer can easily release builds to testers and testers can provide feedback about build given to them for testing. AppAssist also helps to track the number of bugs and crashes reported for any build and who can report bugs and who can't for any build. Statistics & Reports - AppAssist gives an option to identify trends of your app by providing various statistics and graphical reports. 3rd Party Service Hooks - Can configure 3rd party service hooks to forward your bug report to. Support for BugZilla is available at the moment and Bitbucket, JIRA, Pivotal, GitHub is under development.